So much for getting something done every week…Still, I made some new progress this weekend catching up on Flash: Those Who Ride the Lightning. The most visible update is to Christina/Lady Flash. I added a scan of her “Lady Savage” outfit, rearranged the profile a bit, and updated her with her current status as shown in Flash: Rebirth. Contents from the upcoming Flash vs. the Rogues trade paperback. The solicitations only list issue numbers, but in most cases it’s clear that if one story has a one-off villain and the other story has, say, Captain Cold, it’s going to be the Captain Cold story. Notes on villains and guest stars. If the title is “Mirror Master’s Magic Bullet,” it’s obvious who’s in it. But if it’s “The Case of the Real-Gone Flash,” you might not know that it stars Abra Kadabra. Solid through Flash v.1 #130. I have everything that’s been reprinted in later issues of The Flash, or in trade paperbacks, but I’m still missing a lot of items that were reprinted in some of DC’s random 1970s books like Four Star Spectacular. To find them, I’ve gone through the GCD up through #130, so that part of the list is as complete as the GCD is. I’ve also made some smaller updates — added some appearances, listed upcoming series and recent collections on the Series, Books and Specials list, etc. This entry was posted in Site News and tagged Christina, Silver Age on October 25, 2009 by Kelson. I’ve re-read the first issue of Flash: Rebirth so that the setup is all fresh in my mind, and I’ve gone over Flash: Rebirth #2 again. To follow up on my first impressions: Geoff Johns and Ethan Van Sciver continue to deliver a well-constructed story, though some of the pieces it uses strike me as ill-chosen or a waste of material. Van Sciver’s art is, as always, excellent — and incredibly detailed. There’s a flashback sequence to Barry’s life before gaining his powers, and you can clearly see how some characters have aged over the years. There are also some nice symbolic images, such as Sam Scudder (the future Mirror Master) and his reflection (and props to the colorist who gave him an orange and green striped tie). At one point Barry and Wally get caught up in a battle with a villain, and half of Wally’s mask is ripped away. This not only makes it instantly clear which Flash is which (it does get confusing in the pages leading up to that point), but gives us a very clear view of his facial expression on the second-to-last page. And then there’s the cover, an homage to Showcase #4 and Barry Allen’s first appearance. The story picks up on the appearances of Savitar and the Black Flash from last issue, and the unexpected consequences, framed by a painting ceremony in Gorilla City. It follows through on Savitar’s appearance more than I expected (at least before DC posted the preview pages last week), though I get the feeling that DC and/or Geoff Johns is seeing this miniseries not just as a way to set up new pieces, but an excuse to throw out old pieces, even the ones that have been sitting unused in the back of the closet for years. Oddly enough, I’ve had no problems with the pacing of this story, even though the general consensus online (at least among people who aren’t long-term Flash readers) is that it’s too slow. This is especially odd because my biggest criticism of the last two relaunches — Flash: The Fastest Man Alive’s “Lightning in a Bottle” with Bart Allen as the Flash and The Flash’s “The Wild Wests” with Wally West and family — was that they started with big six-part stories that were paced too slow for someone whose main claim to fame is speed. I still maintain that if “Lightning in a Bottle” had been condensed into three parts instead of six, fans would have responded much better to Bart as the Flash instead of rejecting him so thoroughly that DC turned around and killed him. Maybe it’s because of the emphasis on Barry Allen, who has always been slow and steady in contrast to his alter ego of the Flash. That said, I still don’t understand why they felt it necessary to explain Barry’s bow tie instead of just treat it as an artifact of when the original stories were produced. Modern retellings of Superman’s origin don’t make an effort to explain away Clark Kent’s anachronistic hat — they just leave it out. 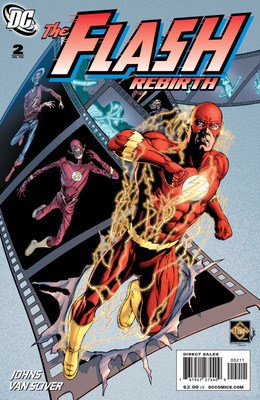 This entry was posted in Reviews and tagged Barry Allen, Black Flash, Christina, Ethan van Sciver, Flash: Rebirth, Geoff Johns, Savitar on May 6, 2009 by Kelson.